I am considering getting hearing aids because I have hearing loss and I know I’m missing out. Many of my friends have them but there seems to be a wide range of prices and choices. How do I know which one is right for me? Are the expensive ones any better than the cheaper ones? What’s the latest in hearing aid technology? 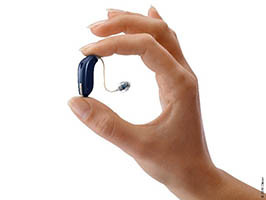 What’s new in hearing aid technology? Lots. Hold on to your ears – you’ll be amazed at what is packed in to these tiny, wearable computers. What is ‘standard’ in today’s hearing aids? All hearing aids today, fitted by an Audiologist, are digital and programmable. This means they connect to software, installed on the clinic computer, and automatically pick up your hearing test results and can be adjusted to suit each person’s preferences. Automatic volume controls – hearing aids adjust themselves 300x per second using a technology called compression which adjusts gain up for soft sounds and turns the gain down for loud sounds. They also automatically stop amplifying if something really loud happens, like an alarm or siren. Adaptable microphones – most hearing aids have two microphones and these microphones create different directional patterns, automatically, depending on what is happening around you. What’s ‘new’ in hearing aid technology? Rechargeable hearing aids that really work. Battery technology has advanced so we can now get 20 hours battery life off a 2-4 hour charge. Batteries are either lithium ion or silver zinc. Your Audiologist can explain the differences and advantages of each type. Hearing aids can now link wirelessly to your phone or other Bluetooth devices and can stream phone calls, music or audio, just like a Bluetooth headset, without having to wear a neckloop streamer device. They can also be controlled (volume, programme settings, equalizer-type adjustments, etc) through an app you install on your smartphone. Remote adjustments – your Audiologist can adjust hearing aids without you having to go to the office for a visit. This usually happens through a link in the hearing aid control app and can either be real-time while you have a virtual visit (through Skype or similar) or the adjustments can be uploaded through your app when you are ready. What’s the future for hearing aid technology? Turns out the ear is a good place to monitor body movements and things like heart rate and temperature. Hearing aids of the future are likely to link with other medical technology to monitor our health and well-being in addition to providing amplification. Over-the-counter or self-fitting hearing aid technology is definitely coming soon, some types of ‘personal sound amplification’ devices (like earbud headphones) are already on the market. These will be non-custom devices from the internet, delivered to your house and self-fit via an app or your computer. The will be a good solution for people with mild hearing loss who just need a ‘starter’ hearing aid, sort of like reading glasses you buy at the chemist. As with most things, technology will continue to filter down to the lower price points, over time. You already get more for your money than you did 10 or even 5 years ago, this trend is set to continue. We are very lucky in New Zealand to have access to all the latest brands and options for hearing aid technology. In fact some companies test-market models here first due to the fact that we have a small population and really well trained Audiologists. Call 475 9849, or visit teresaburnshearing.co.nz for more information. Today I went to a hearing clinic to get a pair of hearing aids. I was given the sound test and shown the hearing aids. I am eligible for the Ministry of Health’s subsidy scheme of $495 as I am 75. I was told that one of the conditions was for me to produce a letter to show I was doing 20 hours of community service. I am on the committee of Inner Wheel and will become President of our Probus Club in March. Both I guess could be labelled community work. Are you able to enlighten me regarding this? – Thanks. Yes, everyone who is a Citizen or Permanent Resident in New Zealand is eligible for a hearing aid Subsidy. You can access this via your Audiologist, once every 6 years, and it is worth up to $511.11, per ear, towards the cost of hearing aids. There are other funding sources which can provide additional support if you meet criteria such as Community Service Card holders who work 30+ hours/week, or care for a dependant family member, or volunteer 20+ hours/week. Sounds like your volunteer work might fit this. Your Audiologist should be able to tell you more about whether you qualify and help you apply. Generally proof of eligibility is required when the application is submitted. Good luck!